LaFleur de Paris: "1.2.3.... say EVA!" 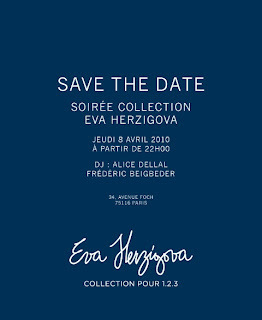 Thursday night, Eva Herzigova showed off her new collection for French brand 1.2.3 at a très VIP party in Paris at a private Hotel Particulier on the Avenue Foch. Eva was stunning in a long black dress as models wearing her collection wandered around the room. Best-selling author-turned media superstar Frédéric Beigbeder joined “it” girl Alice Dellal to play some of the best music I’ve heard at a party in awhile. Paris' in crowd hit the dance floor to move to nostalgic 90s tunes and modern hits. Several French celebs came out for the occasion including Bernard-Henri Levy and Arielle Dombasle, Natalia Vodianova, Melvil Poupaud, Lou Doillon, Vincent Elbaz, Zoe Félix, Aure Atika, Virginie Efira and Patrick Poivre d’Arvor. Former supermodel Herzigova has a two-year designing deal with 1.2.3. Check out these videos from the star-studded evening!